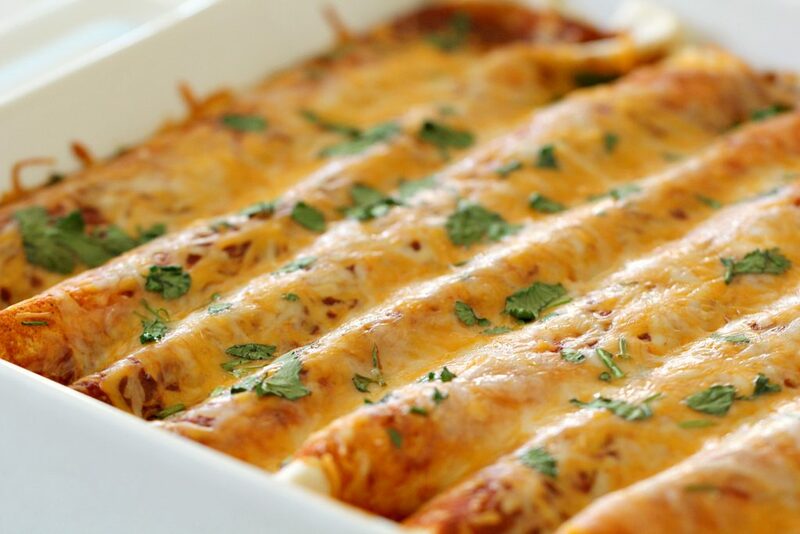 Whether you are vegetarian or a meat eater, you are going to love these Three Bean Enchiladas. They are very filling and taste amazing. You may not even realize that there is no meat. You need these Three Bean Enchiladas in your life. When my husband and I were first married and both in college, we were trying to save as money as possible. Groceries were so expensive each week, so we found ways to cut back where we could. One idea that my meat-and-potatoes husband suggested was that we ate a “meatless meal” once a week. Step 1: Preheat oven to 350 degrees. Spray a 9×13″ baking pan with non-stick cooking spray. Step 2: In a large skillet, warm oil over medium heat. Add onions and peppers and saute until tender. We use olive oil, but you could use avocado oil, coconut oil, or vegetable oil. Step 3: In a large mixing bowl, combine onion and pepper mixture, all the beans, sour cream, cilantro, green chiles, cumin, chili powder, 1 cup shredded cheese, and salt and pepper. Mix well. I did this with a large spoon. You could also do this with a fork. There is a lot to mix, so combine it as best as you can. Step 4: Place 3-4 Tablespoons of bean mixture in each tortilla, roll up, and place tortilla in prepared pan. We didn’t fold up our sides, we kept them open, and transferred them carefully over to the pan. You could also roll them up in the pan as best as you can, but that could get tricky, as you run out of room. Step 5: Pour enchilada sauce over rolled tortillas and top with remaining shredded cheese. Step 6: Bake for 20-25 minutes or until cheese starts to bubble. Remove from oven and top with additional cilantro as a garnish, if desired. I wasn’t exactly sure how to prepare a main dish without using meat, so I had to get creative. Kristen introduced me to her 3 Bean Enchiladas and over the years I have added some tweaks and changes to suit my family’s tastes. 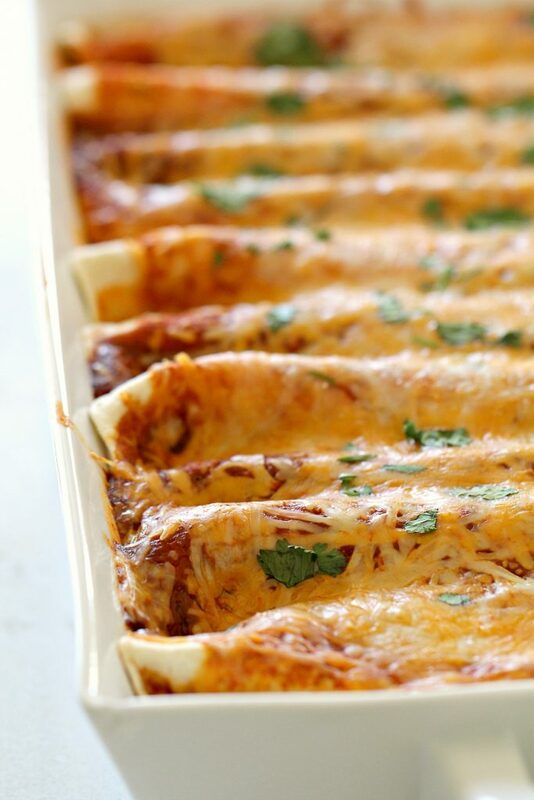 These enchiladas are a huge hit every time I make them and no one ever misses the meat. what can i top my enchiladas with? We love adding a little extra flavor to our enchiladas. I love adding a few more fresh vegetables on top, just to give it that extra kick of flavor. Here are a few of our family’s favorite toppings. -Sliced Olives. We love sliced olives on our enchiladas. If you are short on time, you can even buy them sliced in the can. -Vegetables. We like to put tomatoes, red onion, bell peppers, avocado, corn, etc. If it tastes good on an enchilada, we put it on. We have hundreds of simple and delicious recipes on our channel. We take you through each recipe, step by step, and show you exactly how to make it. looking for side dishes to serve with this? In a large skillet, warm oil over medium heat. Add onions and peppers and saute until tender. In a large mixing bowl, combine onion and pepper mixture, all beans, sour cream, cilantro, green chiles, cumin, chili powder, 1 cup shredded cheese, and salt and pepper. Mix well. Place 3-4 Tablespoons of bean mixture in each tortilla, roll up, and place tortilla in prepared pan. 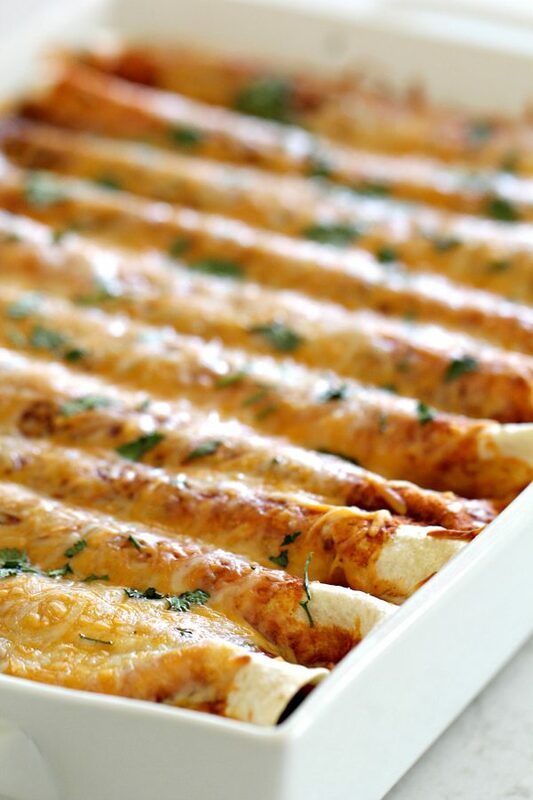 Pour enchilada sauce over rolled tortillas and top with remaining shredded cheese. Bake for 20-25 minutes or until cheese starts to bubble. Remove from oven and top with additional cilantro as a garnish, if desired.